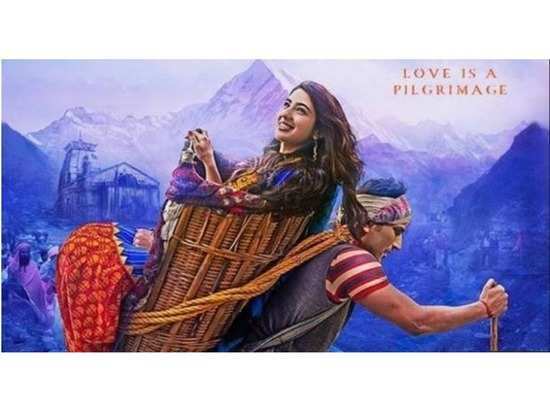 After a long wait, the teaser of Sushant Singh Rajput and Sara Ali Khan starrer 'Kedarnath' has finally been released and what a glorious spectacle it is. As the teaser begins, we see a lone person running down a dark road and a sky that has been engulfed with darkness. With a flood on its way to the town of Kedarnath, we are given a glimpse of two lovers who have to face the wrath of nature. While the teaser featured no dialogues, the dramatic scenery and visuals certainly took our breaths away. Sara is the splitting image of her mother Amrita Singh in the teaser and plays the character of Mukku. Sushant Singh Rajput plays porter Mansoor. 'Kedarnath' will mark the Bollywood debut of Saif Ali Khan's gorgeous daughter Sara. Apart from this, the newbie is also set to share screen space with Ranveer Singh in Rohit Shetty’s 'Simmba', which will hit screens on December 28, 2018. Sushant Singh Rajput was last seen in 2017 film 'Raabta' opposite actress Kriti Sanon. The actor is also set to star in 'Kizie Aur Manny' alongside newcomer Sanjana Sanghi. Produced by RSVP and Guy in the Sky Pictures and directed by Abhishek Kapoor, 'Kedarnath' is all set to release on December 7. Are Ranbir Kapoor and Alia Bhatt all set to tie the knot next year? Karan Johar may be a contributor to Ranveer Singh's quirky sense of style! 'Koffee with Karan': Kareena Kapoor Khan and Priyanka Chopra to make an appearance together? We're loving Shah Rukh Khan and Gauri Khan's adorable social media exchange of messages! Deepika Padukone and Ranveer Singh to wed in two different rituals! Manish Malhotra to design Priyanka Chopra’s wedding ensemble? Jacqueline Fernandez sizzles in green at the One Young India event! 2Are Ranbir Kapoor and Alia Bhatt all set to tie the knot next year? 3Karan Johar may be a contributor to Ranveer Singh's quirky sense of style! 4'Koffee with Karan': Kareena Kapoor Khan and Priyanka Chopra to make an appearance together? 6We're loving Shah Rukh Khan and Gauri Khan's adorable social media exchange of messages! 7Deepika Padukone and Ranveer Singh to wed in two different rituals! 9Manish Malhotra to design Priyanka Chopra’s wedding ensemble? 10Jacqueline Fernandez sizzles in green at the One Young India event!